The Oct 2009 issue of Mopar Action (published in June) has a tidy article on wrangling in that worn out old suspension, with a little twist. It is aimed at 74 and up C-Bodies. Decent article, covers items that several members have already done to their cars, with dramatic results. Yours truly included. Despite what some might think, C-Bodies aren't supposed to float! 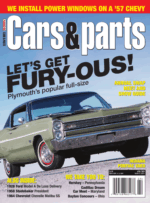 I happened to notice a sweet 68 Fury gracing the cover of Cars & Parts Magazine at the parts store just recently. Nice write up on Fury\'s in General. Don\'t think I have seen this Fury around the board before. Also an interesting side bar on Fury Sales verses the size - Generally the bigger they got, the more they sold. Finally, there was a blurb about Steele showing New Vent Wing Seals for 65-67 C\'s and 67 Imps at SEMA. Cars & Parts is an Amos publication, which also publishes Mopar Enthusiast. The 2009 Calendar Artwork is now available as computer wallpaper. Don't forget that submissions for the 2010 calendar(s) is already taking place. Render time: 0.0164 sec, 0.0041 of that for queries. DB queries: 18.